Saturday May 20th 1922 Put things in my rooms in order. Wrote to LeGrand for birthday. To Ida and Sister Lape. We all went to meet Winnie at 3.35. Evening at home. Sunday May 21st 1922 Winnie, Hattie, & I went to S S and church. Then had dinner in town. Cora brought us home. The Andersons, Ott & Fannie here in afternoon. Lulu & Mr Town all night. Monday May 22nd 1922 The girls washed. I helped Hattie with morning work. Wrote to Lydia. Hattie to meeting in afternoon. Winnie and I walked to town called at Minnie Showers. Hattie met us at Fannies at supper time. We spent evening there. 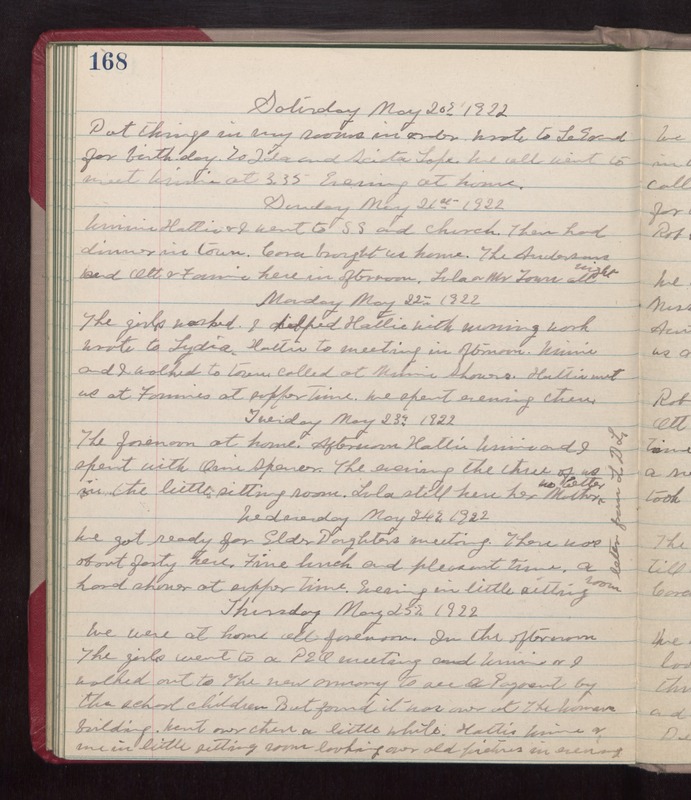 Tuesday May 23rd 1922 The forenoon at home. Afternoon Hattie Winnie and I spent with Orie Spencer. The evening the three of us in the little sitting room. Lula still here. her Mother no better. Wednesday May 24th 1922 We got ready for Elder Daughters meeting. There was about forty here. Fine lunch and pleasant time. A hard shower at supper time. Evening in little sitting room. Letter from L D L. Thursday May 25th 1922 We were at home all forenoon. In the afternoon The girls went to a P E O meeting and Winnie & I walked out to The new armory building to see a Pageant by the school children But found it was over at The Womens building. Went over there a little while. Hattie, Winnie & me in little sitting room looking over old pictures in evening.